It's fun to make, it's fun to eat, and it's fun to talk about. 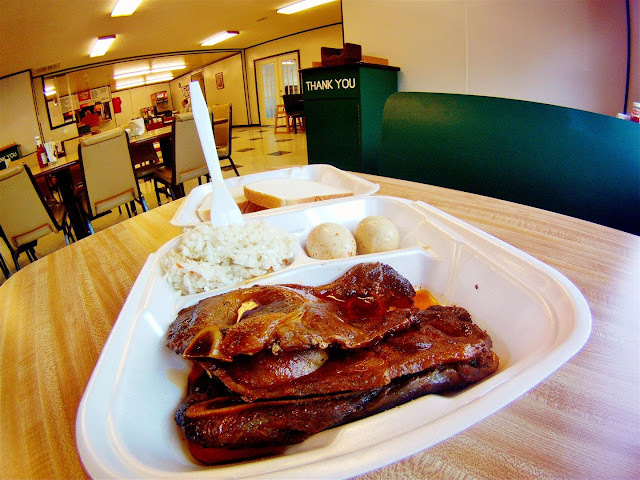 When you go out for BBQ the meals are simple, fast, and affordable. Perhaps the best thing is the way it varies so much from region to region -- the meats vary, the sauces vary more, and opinions vary the most. People can be fiercely loyal to the style they grew up with. There's nothing wrong with that, and I feel South Central Kentucky doesn't get enough credit for the good stuff we have here. Over the past year I've been surprised to learn how many well-established BBQ restaurants exist in this area, so I built this page to guide other folks to authentic BBQ spots in this part of the world. There is no place on this page that I would not recommend or revisit. If you see a restaurant profiled here that you've never sampled, give it a shot the next time you're in their neighborhood. Or better yet... pick one out, take the back roads, and enjoy a Countryside Food Ride. The side items include baked beans, potato salad, & coleslaw. For lack of a better term, this is what I call the most common BBQ style around here. 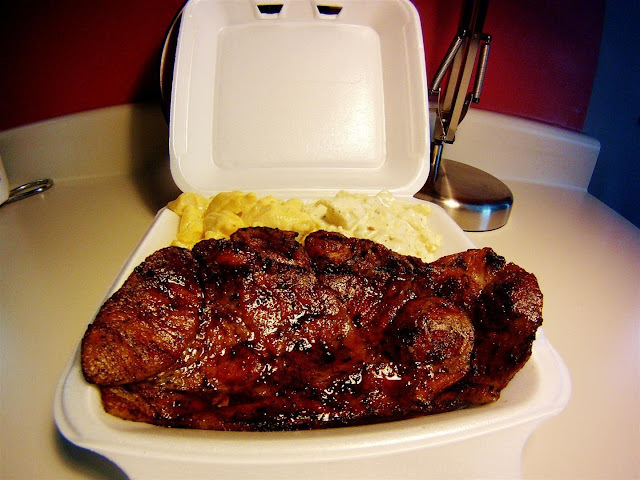 It is characterized by pork shoulder and ribs that are cooked low and slow in hickory smoke. 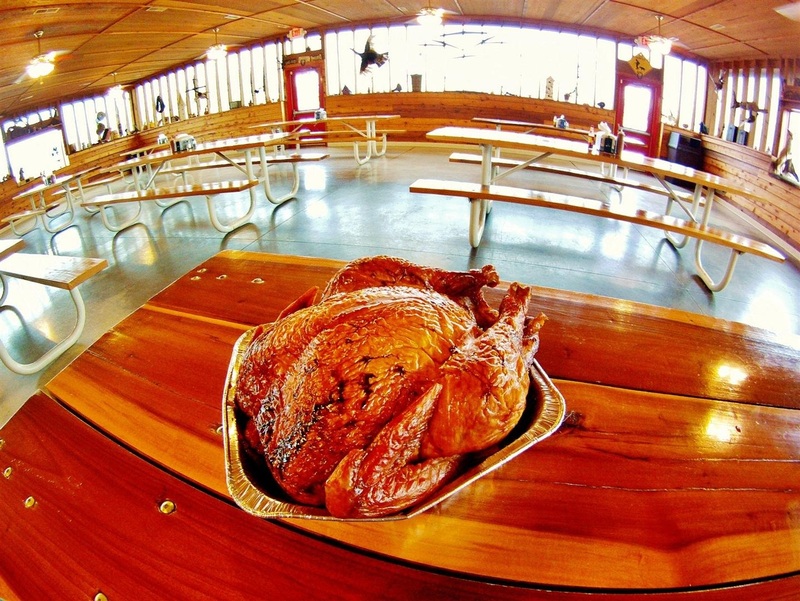 Some places also smoke additional meats and poultry like beef brisket, chicken, and even turkey. But everybody serves pulled pork and ribs. The pulled pork comes from big shoulder roasts (Boston Butts) that are smoked for many hours -- normally overnight -- before the meat is pulled, chopped, or sliced. A dry rub is usually applied before the meat is cooked to develop a tasty bark, but sometimes the meat is seasoned after being smoked. It is normally served sans sauce so you can appreciate the smoke flavor, although the house sauce is occasionally drizzled over the meat, especially when you order a sandwich. Nobody will be offended if you specifically request sauce on side. Ribs are all over the place -- a few places serve baby backs, but most smoke big spare ribs. Some are still slightly chewy coming off the bone, and you can pull the bone right out of others. Some are served in a slab and some are individually sliced. Some are served dry and some wet. The house sauce is usually a thin, bright red, tomato-based affair that is more sweet & tangy than smokey or spicy. Most places offer at least one spicy version of their sauce and some also serve a darker, thicker, smokier version similar to the popular store-bought Kansas City styles (sometimes it is a popular store-bought sauce). Several places prepare a vinegar-based sauce, too. Corncakes are always available, whether you order a sandwich or not. Sandwiches are usually served on regular hamburger buns, but sometimes you'll find big toasted & buttered sandwich buns or Texas Toast. 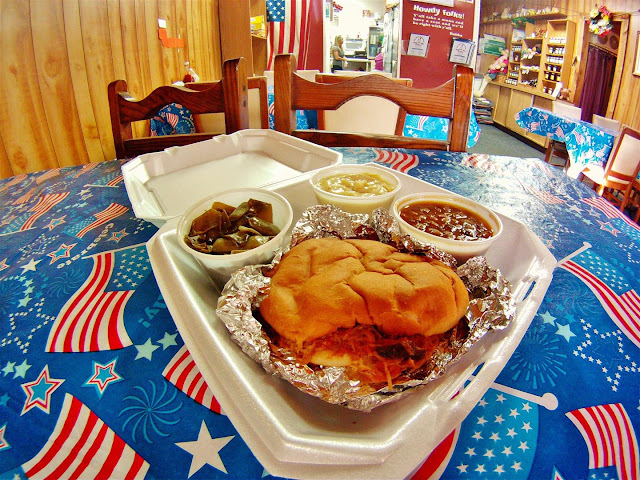 Tompkinsville is a small town that supports more BBQ joints than should be possible. These places occasionally burn to the ground, and they always come back bigger and better. I don't know if T-ville holds some sort of BBQ-per-capita title, but I'm sure there's no other place like it in Kentucky. Forget about smoke -- this is all about hot hickory coals, thinly sliced pork shoulder, and a seriously peppery vinegar sauce (or dip). These establishments also serve ribs and shredded pork, but it's really all about the sliced shoulder. The vinegar sauce is similar to an East Carolina sauce, and at least 3-4 times spicier. Cayenne pepper and butter often give it a bright orange color, but it is sometimes a dark red or even brown. A little bit goes a long way. The sauce is kept warm on the grill and the meat is mopped while being cooked directly over hot coals. You can order the shoulder slices plain right off the grill, but they are usually sprinkled with or dipped in the sauce, depending on how hot you want it. Again, ribs vary. Some places serve big slabs of spare ribs that have a nice bark and smoke ring, indicating that they were smoked for awhile. Some serve big slabs of spare ribs that have no evidence of being smoked or grilled at all. Other places serve country-style ribs or sliced spare ribs that are definitely cooked over smoldering hickory coals. Either way, the ribs are most likely finished with a sweet tomato-based sauce. 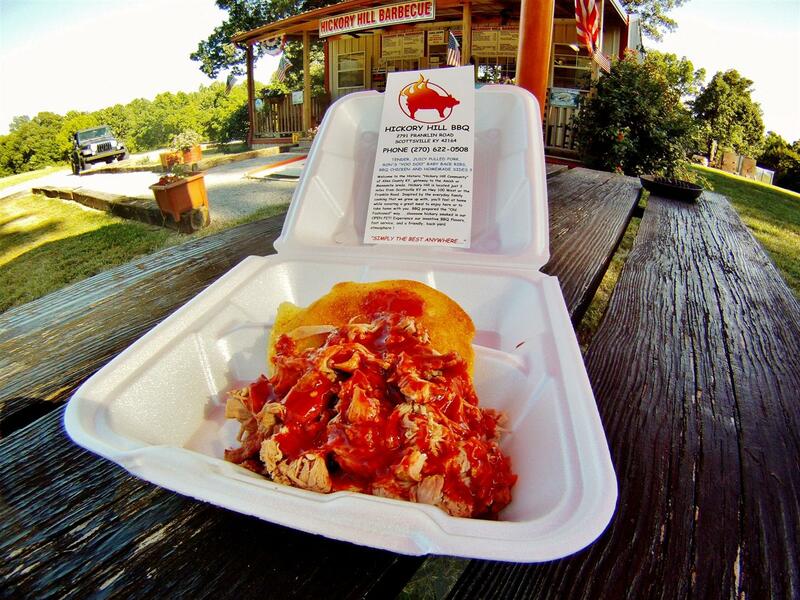 In lieu of pulled pork, Monroe County BBQ joints offer shredded pork that is always mixed with a sweet sauce before being served. Some places truly do cook the pork over hickory and it is lightly sauced to bring back some moisture. Other places cook it in a crockpot and drown it in sauce to add flavor. And while nobody has admitted this to me, I've been told and I suspect that the meat is sometimes boiled. No!!!! Everybody serves a sweet vinegar slaw, presumably because it helps with the heat of the spicy sauce. And more often than not, these places have extra sides like green beans, mashed potatoes, and macaroni & cheese. Unless you just order a shredded sandwich, every order will come with two slices of white bread. Two slices, every time! I visited the four places in Monroe County that were most recommended by locals or transplants, and I've heard of three or four others. In the map below, it's easy to spot the small cluster of red checkpoints toward the Southeast. Outside of Tompkinsville, Smoke Shack in Scottsville and Smokey Pig in Bowling Green are great ambassadors. Eventually I might make this a separate site, as I know it seems cluttered to have twenty places profiled on one page. The map and index below both provide direct links to each establishment. BBQ, BarBQ, Bar-B-Q, Bar-B-Que, Barbeque, or Barbecue? Noun, verb, adjective, or adverb? I love anything cooked with fire, and I know people in California use the terms differently than people in Kentucky. On this page, I use BBQ as a noun to describe the finished product. I'm not a BBQ expert. Steven Raichlen at Barbecue! Bible is an expert. Meathead at Amazing Ribs is an expert. Rockin' Ronnie at Barbecue Secrets is an expert. I'm just a guy who likes to grill and who visited a lot of restaurants with a helmet cam this past year. I'll try to keep my opinions to a minimum and provide a description of each place rather than a review, and hopefully the pictures do most of the talking. If I got something glaringly wrong, feel free to post a comment or send an email. 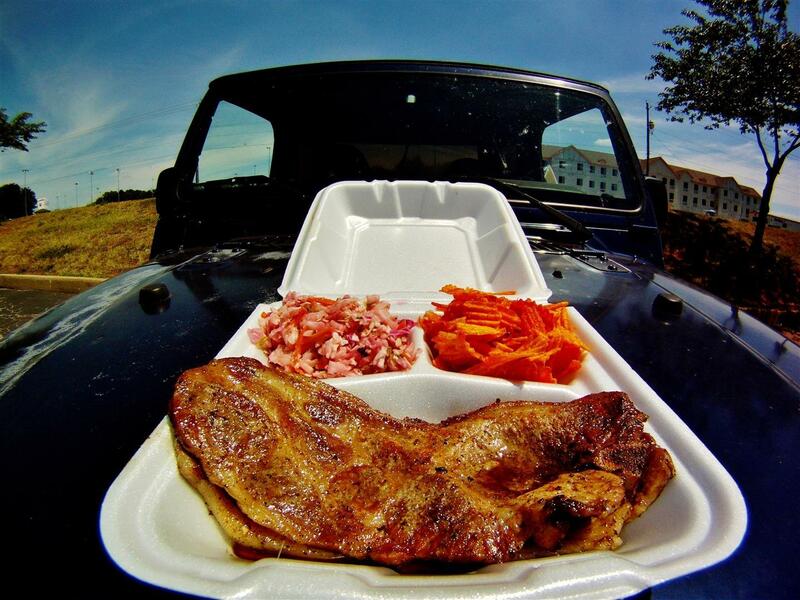 This is the world's first GoPro BBQ Guide. The pictures are from a HD HERO, which wasn't exactly designed to take indoor food photos. If I was trying to sell a book I'd use different equipment, but I'm not selling anything (notice no ads). That being said, if anybody knows Gary P West, please tell him I think we'd work well together. I never received a free meal while working on this project, and nobody gave me a special plate because they knew I was taking a picture -- this is how the meals looked as served to a paying customer on any given day. Sometimes I later asked permission to take certain pictures, but always after sampling the product. I have since become friends with some of these folks, and that's only natural because BBQ people like to talk about BBQ. Never has a friend convinced me that bad BBQ is good BBQ. The restaurants look empty because I avoid the busy hours. They say nobody wants to eat at an empty restaurant, but I love to -- that's when you get to chat with the employees or the owner and try to learn some tricks. I'd rather show up at 2:30 than 12:30. I'm not including phone numbers and business hours for every establishment because those things change. Many BBQ joints are closed early in the week, but every place on this page is open on Fridays (at least in the Summer). That's all I can say with any certainty, and I've learned from experience that it's best to call an unfamiliar place and make sure they'll be open. Some of these businesses even have inaccurate information on their own websites, so get a voice on the phone before you hit the road. Sometimes they sell dessert. I've never ordered one. I'm not discussing Owensboro because I just don't understand what they're doing up there with the mutton, burgoo, and black dip. 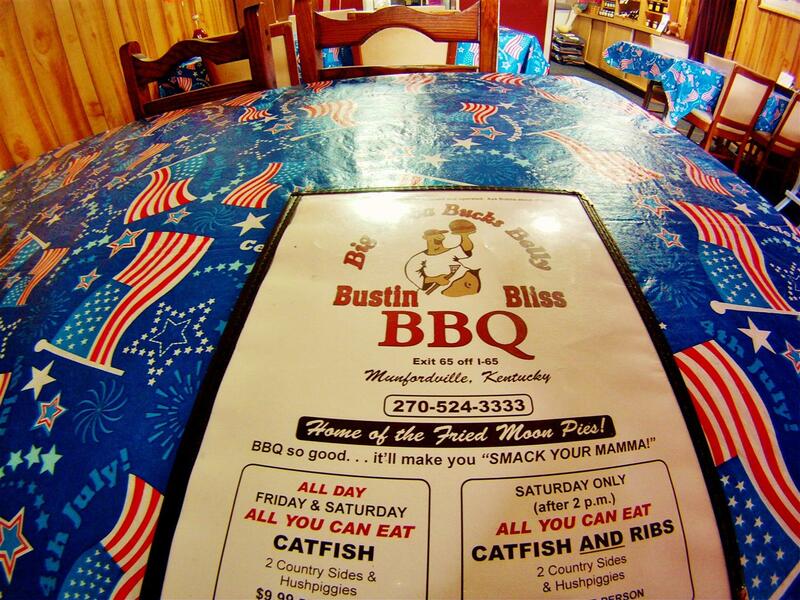 It's only an hour away from Bowling Green, but it's like a different universe when it comes to BBQ. 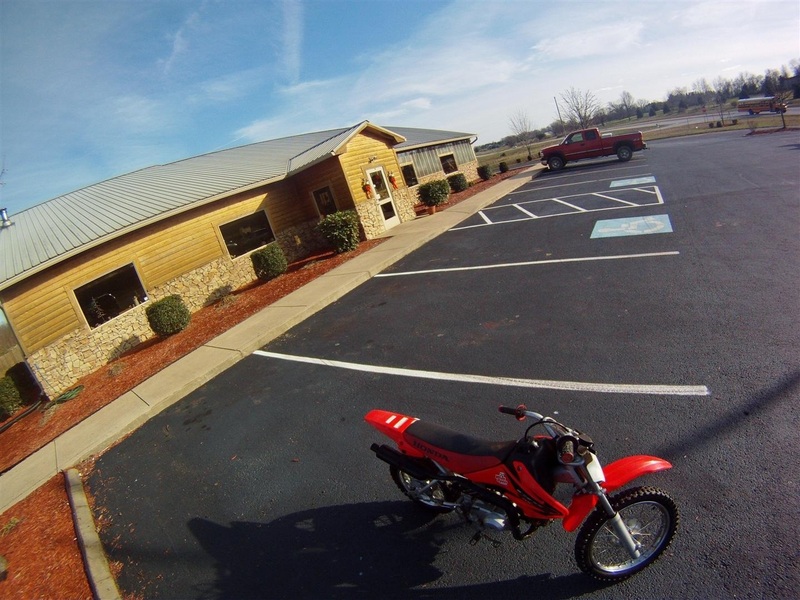 We did ride to Old Hickory Pit Bar-B-Q and got some good pictures last year, though. 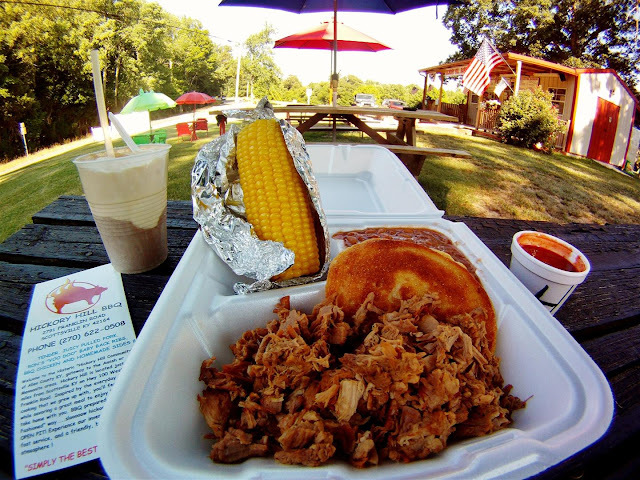 UPDATE: For more info on Monroe County BBQ, listen to this well-produced radio documentary by Rachel Hopkin on WKU Public Radio. She visited three of the places I profiled below, and she did an excellent job of describing the BBQ and the people. UPDATE II: I just learned that WKU professor Wes Berry is finishing a book about Kentucky BBQ right now! His book covers the entire state and it should be available in Spring '13. In the meantime you can peruse some of his KY BBQ photos on this facebook page. UPDATE III: Websites (or facebook pages) have been added for the restaurants that have 'em. As mentioned above, I know some of these sites have inaccurate information regarding business hours, so it's best to call and make sure they are open. 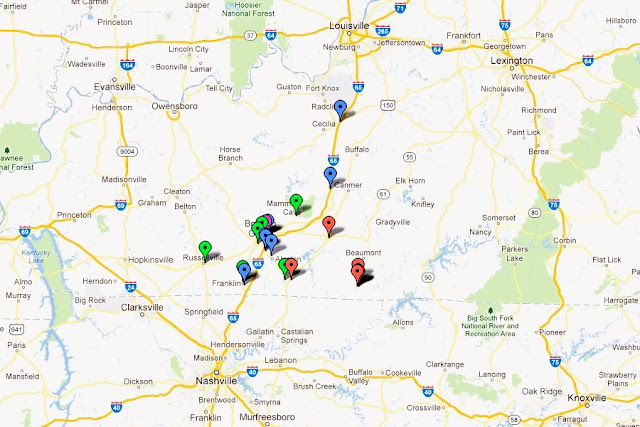 The interactive map above shows the places that are profiled below, and the ones that are frequently open and easily accessible from I-65 are highlighted for those who might want to sample authentic Kentucky BBQ while traveling between Nashville & Louisville. 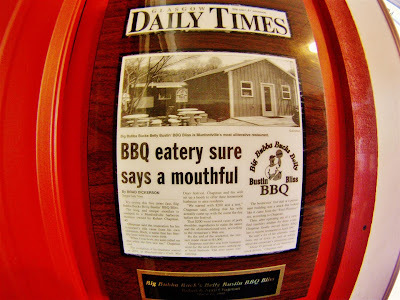 The original Split Tree Barbeque was located a few hundred feet in front of the present location -- right in the middle of the new four-lane version of US-231. It was closed down for a few years after being demolished, and when Jerome decided to rebuild he did it right. This is the biggest BBQ building around and this is what a BBQ joint should look and smell like. There is a hunting motif at work here, and the walls are covered with business cards left by the patrons over the years. 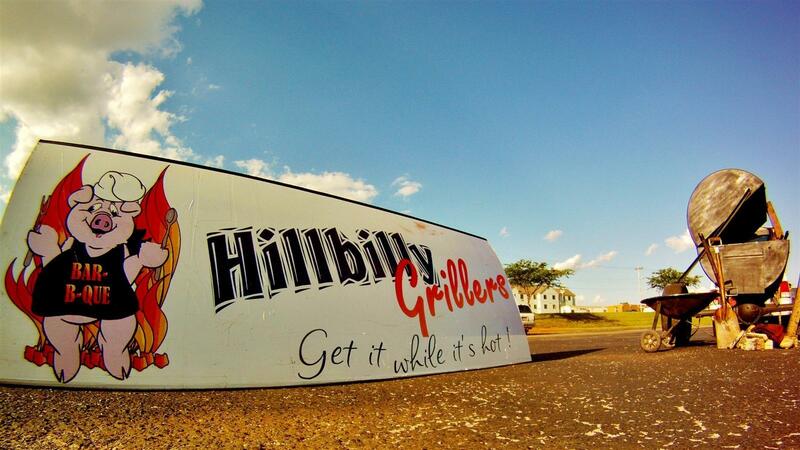 They serve hickory-smoked pulled pork (chopped or sliced), ribs, and half chickens. If you order sliced pork or ribs while it's not too busy, hang out at the counter and you can watch them slice your order from a shoulder or a slab of ribs that just came off the smoker with a nice dark bark. The sides are baked beans, potato salad, and coleslaw. The beans have a good amount of pepper and chopped pork and I think they're the best around. 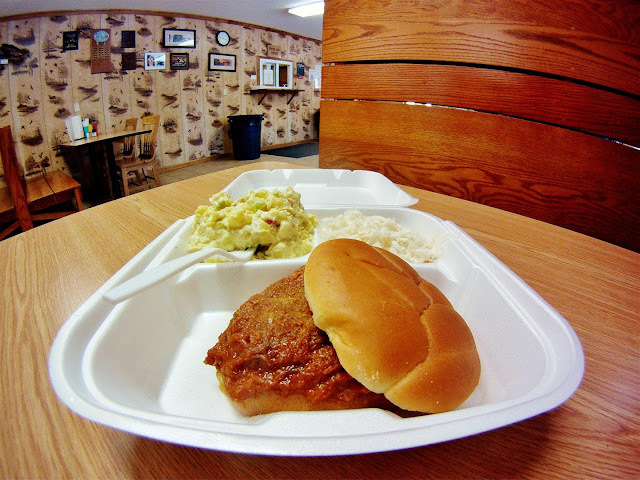 They don't have a big menu, but they make the most of it by serving things like the Slaw Sandwich or the House Special (corncakes topped with chopped pork and smothered with beans). It also means their products are remarkably consistent from one visit to the next. Their bright red tomato-based sauce is quite sweet and slightly tangy, and it's the only one they provide. If you're looking for spicy, there are bottles of popular hot sauce on the tables. The pork is so good you might not even care about the sauce, but definitely try adding some to the beans. Yum. This is one of the biggest BBQ restaurants around, so it's a good place for group gatherings. 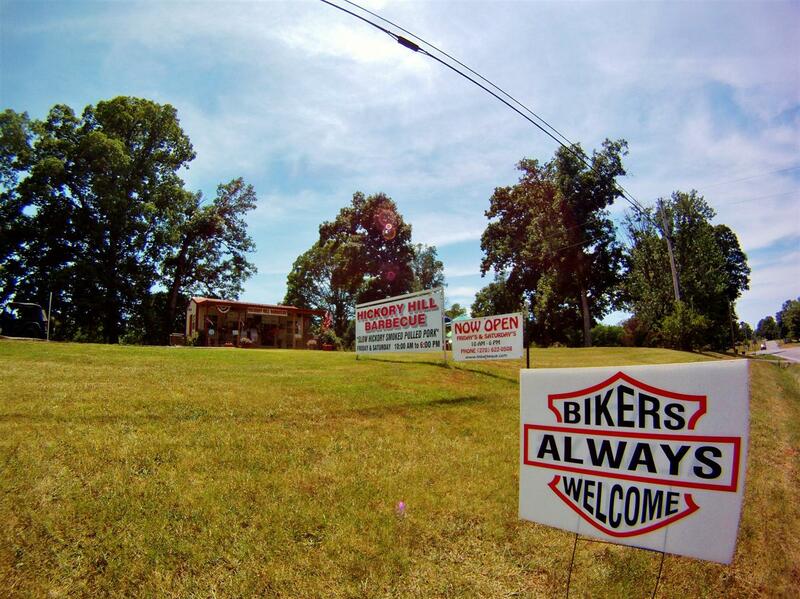 They are also open more often than most places on this page, so don't be afraid to stop by on a Sunday or Monday. Sliced Pork Sandwich w/ Baked Beans (sauce on side). When you see a bark and a smoke ring like that, you definitely want to taste the meat before adding sauce. Some have said I'm biased towards Split Tree. It's true. This is the pulled pork that I judge others by. Corncakes + Chopped Pork + Beans. Don't try eating this in your car. Chopped Pork, Sliced Pork, & Ribs. Two Half Chickens, Slaw, Potato Salad, & Corncakes (to go). BONUS: Smoked Turkeys can be reserved for Thanksgiving & Christmas. Everybody around here knows who Jimmy Diemer is. He and his brother are mostly known for the grocery stores they operated in the area -- Joe ran the grocery their father started in downtown Bowling Green until retiring just a few months ago, and Jimmy ran a popular gas station and grocery store right on this property until turning it over to Houchens back in 2005. Fortunately for us, he didn't go far and he now concentrates on this BBQ & catering business. There are a couple tables outside and you can grab a quick BBQ lunch plate anytime, but I'm sure most people consider this a carryout spot where you grab something (or a lot of somethings) to take home. 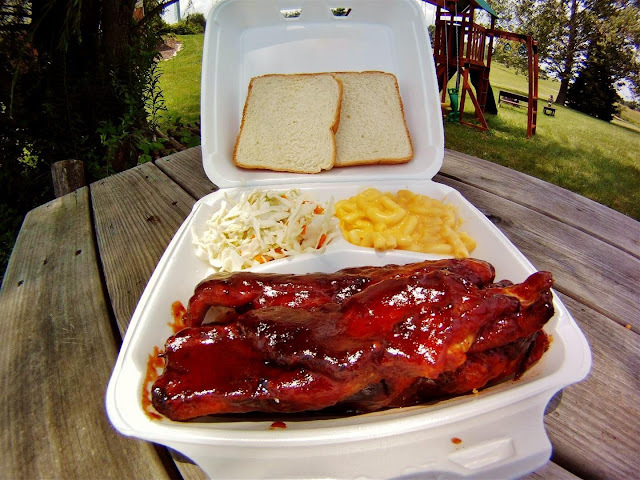 Jimmy D's is like the Sam's Club or Costco of BBQ, where everything is made in-house and nicely packaged so it's easy to through a big meal together in a hurry. If it can be smoked, it is smoked here and it is in one of those refrigerators. But you're not limited to BBQ -- the amount of food and the number of choices is ridiculous (this is my go-to spot if I ever need to pretend I made homemade mashed potatoes & gravy, for example). The smoked BBQ items do have a heavy hickory flavor and their sauce is a thick dark tomato-based deal that is also heavy on the smoke flavor. Personally, I think this sauce on their BBQ results in a taste that is too smoky, so I like to have a sweeter sauce on hand when I take Jimmy D's home. They also have a dark red vinegar-based hot sauce with plenty of crushed red pepper and cayenne flavor. If you ever happen to stop by while Jimmy is here, make sure you say hi. He's a pleasure speak with, especially if you're talking BBQ. 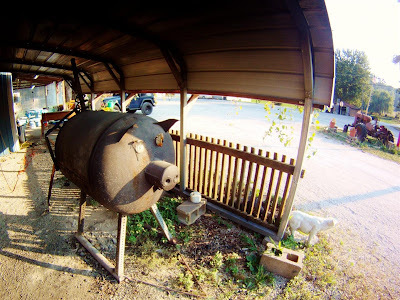 Don't be surprised if he offers to show you the smoker, which is impressive and in constant operation -- that's why it always smells so good over here. He'll also sell you a shopping cart full of hickory, and that's nice to know in a pinch. 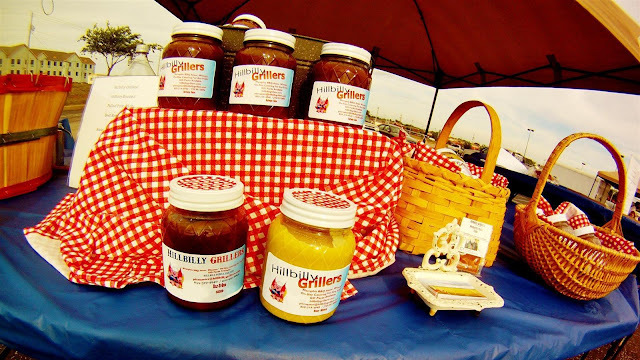 Plenty of jarred and canned items are available including local sauces, jams, jellies, relishes, honeys, etc. Green Beans, Mashed Potatoes, BBQ Beans, BBQ Sauce, Hot Sauce, Coleslaw, Creamy Coleslaw, Potato Salad, Cucumber & Onion Salad, Meatloaf, Turnip Greens, Buttered Corn, Pimento Cheese, Cornbread, Turkey Gravy, Macaroni Salad, Pulled Pork, Banana Pudding, and much more! 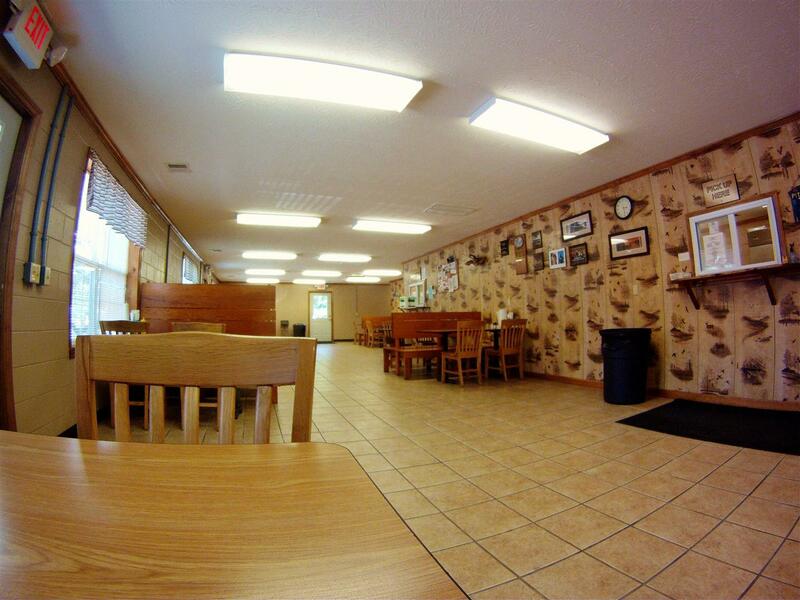 Step up to the counter to order a lunch plate or a sandwich. Beef Brisket Sandwich with Pinto Beans & Coleslaw (to go). Sliced Pork Shoulder (to go). Pulled Pork Sandwich w/ Macaroni Salad & BBQ Beans (to go). Baby Back Ribs, warmed up and sauced at home. Archie's Smokehouse was located on the other side of town until just recently. I've seen their commercials and I did plan on visiting, but never got around to it. About a month ago a pink pig dancing on the side of Scottsville Rd got my attention and made my day. Archie's moved closer to me! Welcome, neighbors. I hope you stick around for awhile. All the BBQ is smoked on-site out back, and the sides are homemade. "Nothing from a can," as they say. They make a sugary-sweet tomato-based sauce and a hotter darker version that tastes about the same with more of a cayenne kick. This is another place where you should try the meat before you cover it in sauce, because you might agree that it doesn't need any. We haven't tried everything yet, but everything we've tried has been great. This is one of the few places that serves smoked turkey, and I'd much rather pop in here for a turkey sandwich than run through one of the nearby drive-thrus for a burger. I've never ordered dessert, but I've been told Archie makes the best chocolate pie in town. 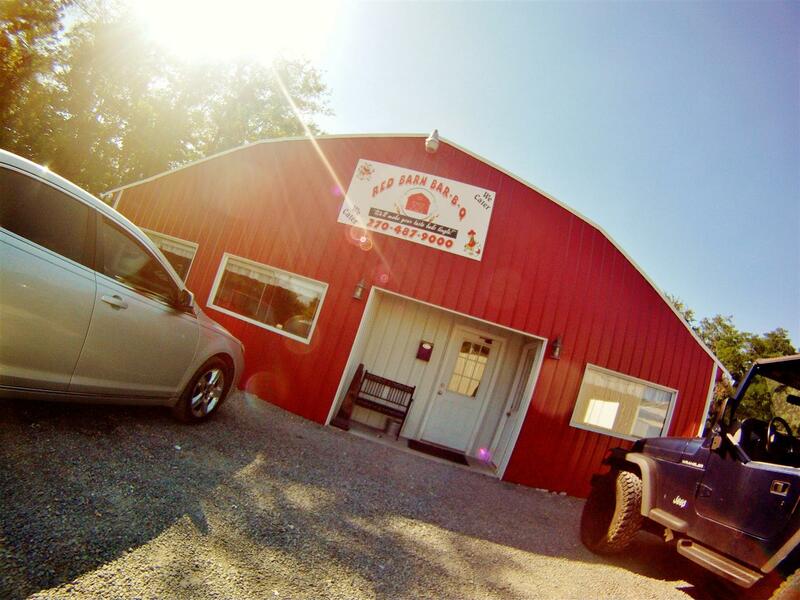 Conveniently located right at I-65 Exit 22, it's a fine place to grab some BBQ if you're ever passing through town. UPDATE (7/14/12): I think they didn't stick around for awhile. It looks like they are closed -- perhaps it is something temporary or perhaps they are moving again, but they weren't open this week. Bummer. UPDATE (8/17/12): I hear Archie's is running a commercial that says they are open on Fridays and Saturdays again? Hope so! Pulled Pork & Beef Brisket w/ Potato Salad & Baked Beans. Ribs w/ White Beans & Slaw (to go). Smoked Turkey Sandwich (to go). Smoked Turkey & Brisket w/ Fries (sauces on side). The Hillbilly Grillers demonstrate one of my favorite facts about BBQ -- you don't have to visit a restaurant to get some of the best stuff around. There are thousands of people like me who enjoy firing up the grill or smoker on weekends. We pretend we know what we're doing and sometimes it turns out pretty good. It's always fun. Then there are people like Donny Bray with the Warren County Pork Choppers who prove they know what they're doing by collecting trophies on the BBQ competition circuit (Donny was recently featured on an episode of BBQ Pitmasters, and if you ever get a chance to sample his ribs, you better sample those ribs). 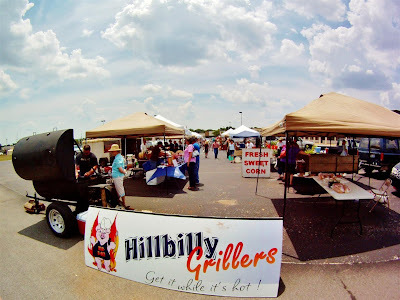 And then there are people like the Hillbilly Grillers who occasionally compete, but are more often found at festivals or markets selling BBQ by the pound, hot BBQ plates, and jars of homemade sauces & rubs. 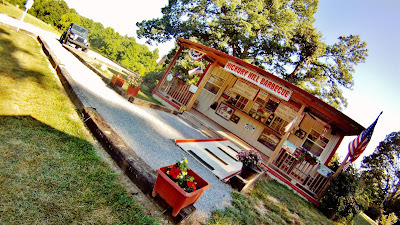 The best place to find them these days is at the Bowling Green Community Farmers Market on Tuesday evenings or Saturday mornings, and that's the address I used for them on the SoKY BBQ Map above. They are also available for catering and you can contact them through their website listed above. 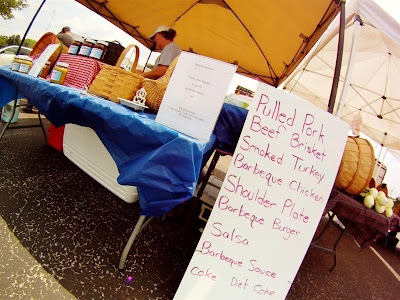 Jim is from Monroe County, so he makes a mean spicy vinegar sauce (they call it Red Sauce) and he grills some killer sliced pork shoulder -- it's every bit as good as anything you'll get from the T-ville places on this page, and you know it's fresh when you get it right off his grill. 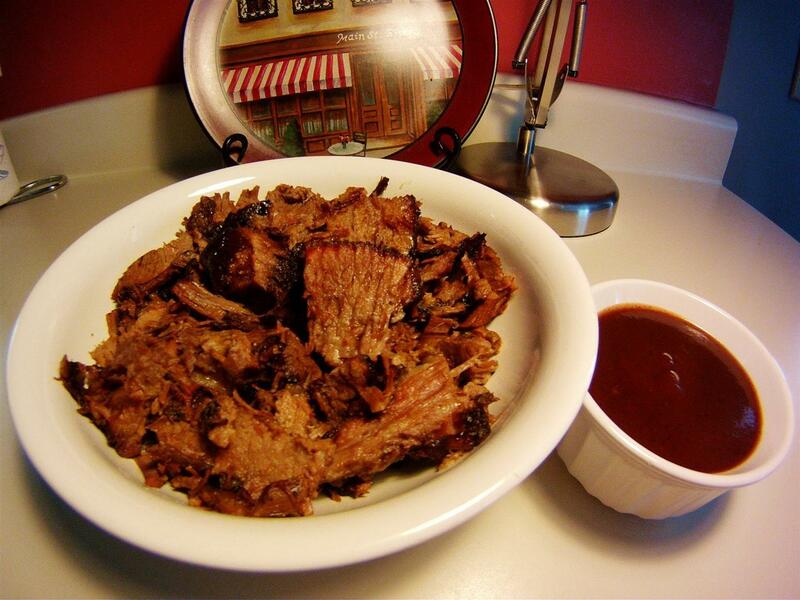 But they don't limit themselves to Monroe County BBQ -- their hickory-smoked pulled pork & beef brisket and applewood-smoked turkey is as authentic as it gets when it comes to Western KY BBQ. Those meats are sold by the pound and they also do ribs, but I haven't sampled them yet which are great -- especially the hotter version. When Jim is cooking up sliced shoulder, chicken quarters, or cheeseburgers for the BBQ plates, Kay has homemade sides like vinegar slaw, potato salad, pasta salad, or beans at the ready. The menu is different every week, so visit often or check the Farmers Market facebook page to see what's cookin' for Saturday lunch or Tuesday dinner. Jim grilling up some Sliced Pork Shoulder. Pork Shoulder Plate w/ Potato Salad & Pasta Salad (to go). Pork Shoulder Plate w/ Vinegar Slaw (featuring purple cabbage) & Chips. 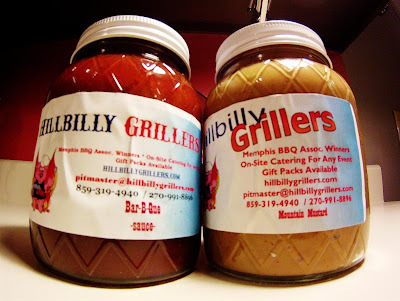 Beef Brisket (to go) & Hillbilly Grillers Bar-B-Que Sauce. 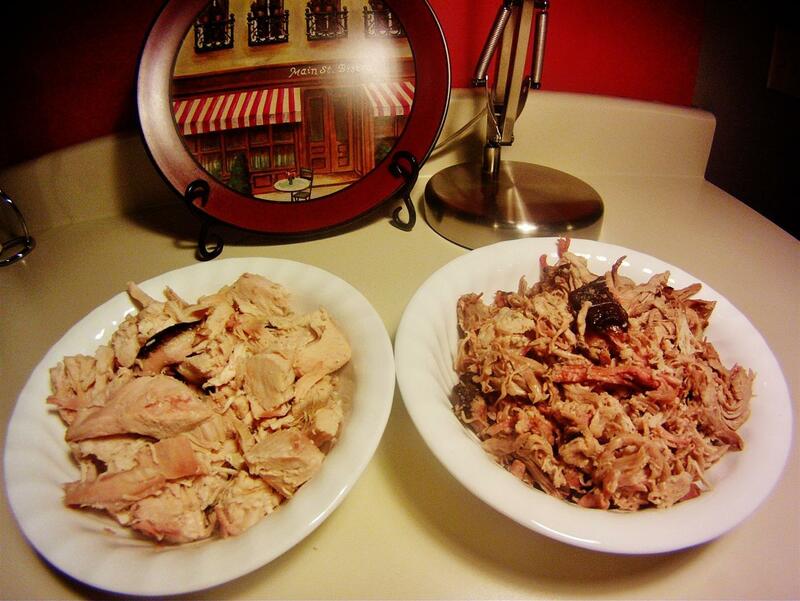 Applewood Smoked Turkey & Hickory Smoked Pulled Pork (to go). Pork Tenderloin Sandwich w/ Chips. Hillbilly Grillers Bar-B-Que Sauce & Mountain Mustard. Both are great finishing sauces on the grill, and this might sound weird but the Mountain Mustard is awesome on breakfast sausage (I learned that from somebody at the Farmers Market). 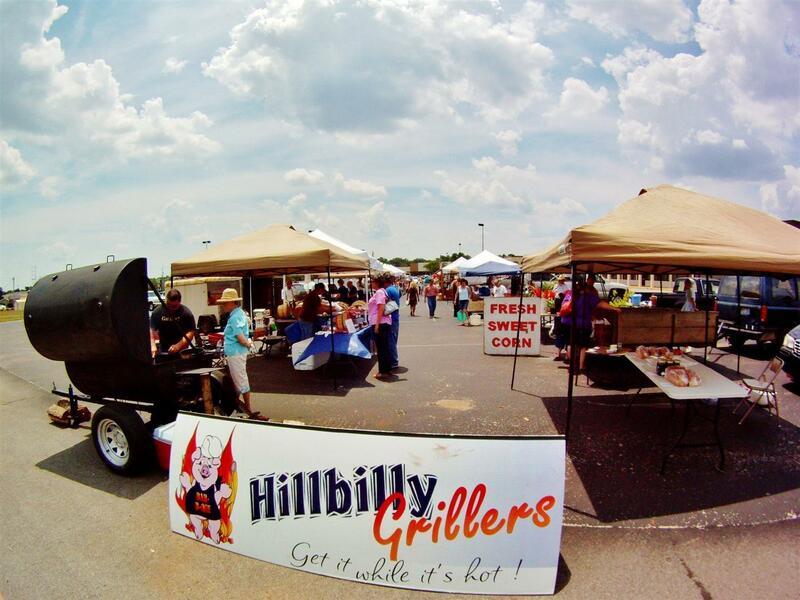 Hillbilly Grillers @ Bowling Green Community Farmers Market. The Best of Shake Rag. Either this is one of Bowling Green's best kept secrets, or I was just the last to know about it. I visited for the first time this past winter when it was known as The Best of Shake Rag. The name has since changed but the staff did not completely turnover. The menu is still the same and the BBQ is still great. It was easy to miss this small building while driving by over the winter, and with the new signage it stands out a lot better now. Consider this a carryout place if the weather conditions don't permit patio dining because there are only three or four stools at the bar inside. More than once I've had to wait for people to leave before I could enter and place my order, and I'm not complaining. The pork is hickory smoked out back and they might have the best sauce in the area. It is the same red tomato-based style that is so popular around here, and I think Third's has the best combination of sweetness and tartness with just a hint of spiciness. The sides are good, too -- everything seems just a little sweeter here. Beyond the BBQ, they are also popular for chicken wings and fried whiting & catfish. 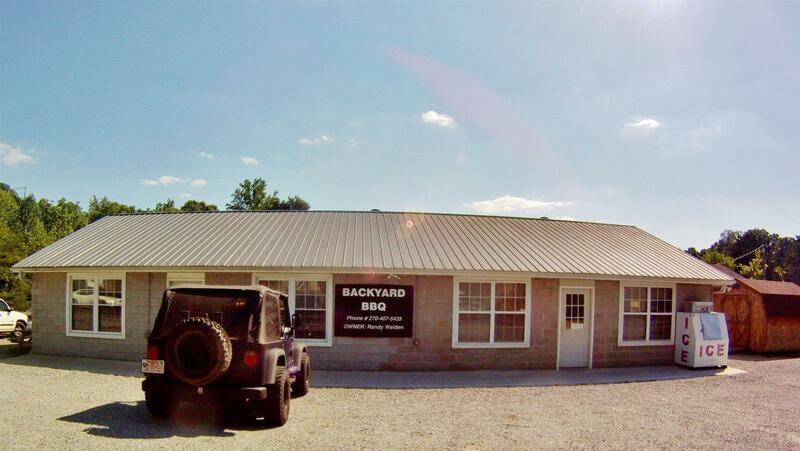 Conveniently located in the Shake Rag district of downtown Bowling Green, it is just two blocks from the Medical Center & Graves Gilbert, one block from the 31-W ByPass, and three blocks from Louisville Rd. Now you know, so check it out. Ribs & Pulled Pork (sans sauce). Pulled Pork Plate w/ Coleslaw & Baked Beans (to go). Rib Tips Plate w/ Slaw & Potato Salad (to go). Pulled Pork Sandwich on the patio. This is Bowling Green's newest BBQ spot and it stands apart from the others for several reasons. It's easily the nicest restaurant space of any real BBQ place in town, and with the big TVs lining the walls it feels like an Old West steakhouse and a sports bar at the same time. Like no other place on this list (besides Texas Outlaw in E-town), they do have a full bar and they stay open past 8:00pm. The menu contains non-BBQ items like steaks & burgers and there are more sides than usual to choose from. 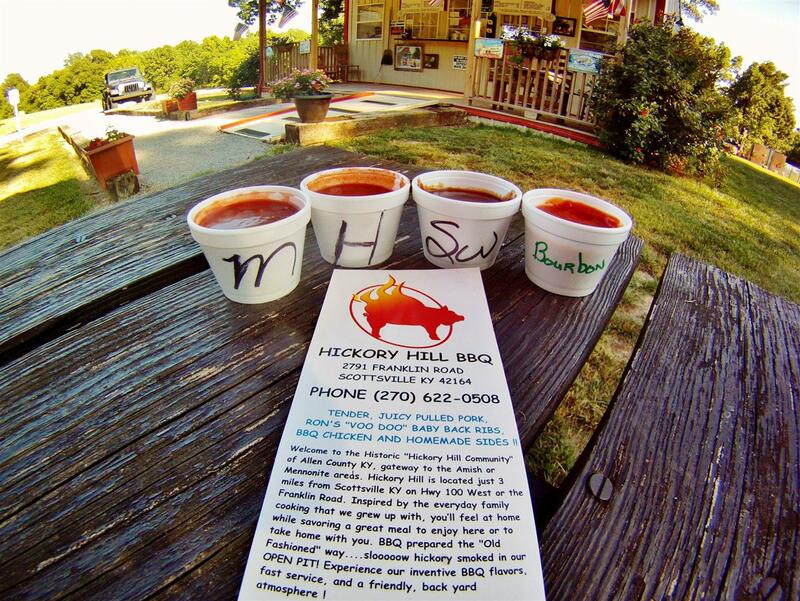 They'll bring four different sauces to your table if you order BBQ -- Mild, Hot, Sweet, & Smokin' Sweet. Hot is the only vinegar-based sauce. Mild is much like the other sauces in the area, Sweet is darker and sweeter, and Smokin' Sweet is the same with a smokey flavor added (similar to the popular Kansas City style sauces). If you ask, there might be a fifth sauce in the back that the owner is experimenting with -- the first time I visited he brought out a really good vinegar-based sauce that was better than the bottled Hot sauce on the table. When I walk into an atmosphere like this I don't expect real BBQ that is smoked on-site, but that's exactly what you'll get here. With such good sauces available, it's ironic that the owner believes BBQ should be judged without sauce and that is how the meat is served. That's what I like to hear and he's confident because it is good. Everything we've tried has been top-notch. The brisket is the best I've had around here, and I don't think anybody else serves smoked pork tenderloin like they do here. Bowling Green is a notoriously difficult spot for new restaurant businesses, and I really hope this one makes it. In my opinion, the only thing that would make it better is if they moved closer to my couch like Archie's did. I kid, I kid! Pulled Pork Sandwich w/ Hashbrown Casserole. The buttered & toasted buns are a nice touch and that's definitely enough meat for two sandwiches. Pulled Chicken Sandwich w/ Potato Salad (to go). Beef Brisket Sandwich & Cabbage Wedge (to go). Pork Tenderloin Sandwich w/ Loaded Baked Potato (to go). 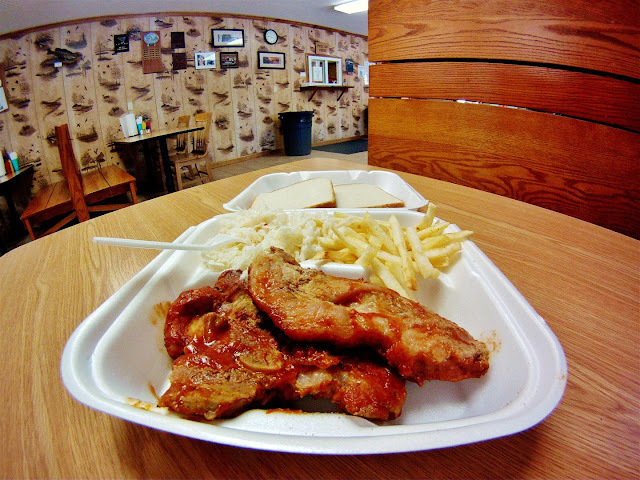 Baby Back Ribs (Smokin' Sweet Sauce) w/ Slaw, Beans, & Texas Toast (to go). Smokey Pig is legendary in these parts. It's surely the most well known spot for BBQ in the area. 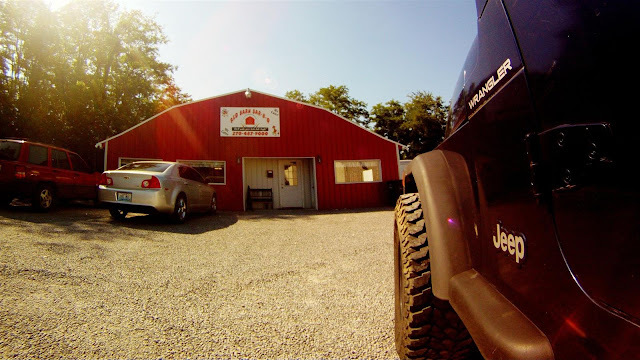 Specializing in Monroe County BBQ, there's really only one thing you need to know about visiting Smokey Pig -- get the pork shoulder and get it dipped. If you visit Smokey Pig and you don't get the dipped shoulder, then you didn't have Smokey Pig BBQ! The pork shoulder is sliced very thin and grilled (not smoked) over hot hickory coals. The sauce is a very spicy vinegar & pepper concoction and you can order several ways depending on how hot you want your meat: light sprinkled, sprinkled, dipped, double dipped, hot, & extra hot. I have no idea what hot and extra hot means, because double dipped is plenty hot for me. Of course they also serve shredded pork, which is definitely cooked over coals here, and mixed with a little sauce to moisten it back up. A dark, thick, sweet tomato-based sauce is also available on the tables. Their big country style ribs are mopped with the spicy vinegar sauce while being grilled, and then dipped in their sweet rib sauce. And they are excellent -- you might consider them dessert. The sides are good and the portions are large. The red-skin mashed potatoes are some of the best around, and if you ordered your meat dipped it's a good idea to get the sweet vinegar slaw to help with the heat. If the place is packed and you have to park on the street, don't worry. The dining room is pretty big, and even when the line extends to the wall and wraps back around to the door, you won't have to wait long. They know what they're doing and the line moves fast. Unlike any other restaurant in town, they have a second dining room that overlooks the river. Cool. And, oh yeah, they also serve beer. Beer & BBQ is quite common in backyards around here, but very rare in restaurants because outside the city limits everything is dry. If you're ever passing through the area on I-65 and you have some time to kill, stop at Exit 28 -- check out the National Corvette Museum and Smokey Pig Bar-B-Q to get a good idea of what Bowling Green is all about. You might want to stay awhile! Or you might want to drive over to Monroe County. The back dining room overlooks Barren River. Dipped Shoulder w/ Red-skin Mashed Potatoes & Slaw. Ribs (one pound to go). Jumbo Shredded Pork Sandwich w/ Red-skin Mashed Potatoes & Beans (to go). Double Dipped Shoulder w/ extra Sauce (one pound to go). Rib Plate w/ Vinegar Slaw and Mac & Cheese (to go). 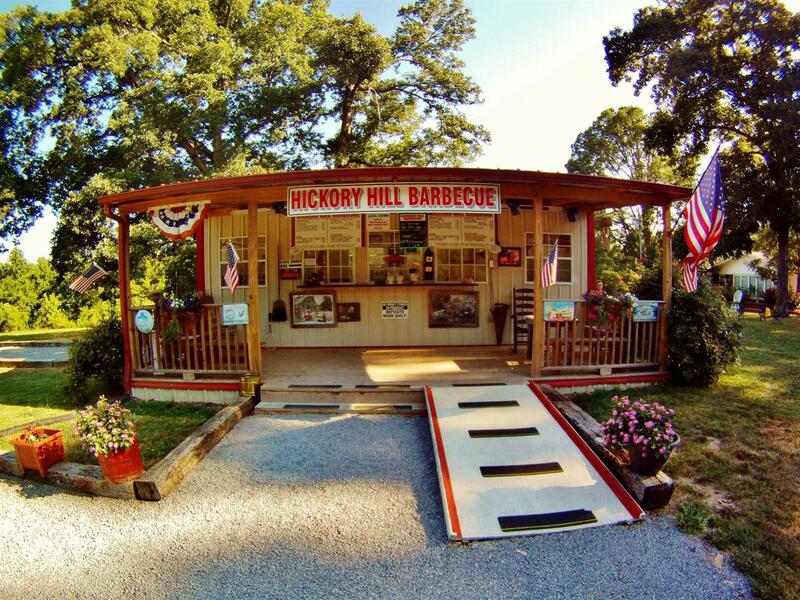 I first noticed this place while riding through the aptly named Hickory Hill community last October, and I even posted a picture on my Paradise Point story to remind myself to check it out someday (that story also has some good BBQ pictures from a party right down the road). When both Rachel Hopkin and Wes Berry recently suggested I pay a visit, I knew it must be good. Hickory Hill is only open on Fridays & Saturdays, so I dropped in on a Friday afternoon. I was back on Saturday. This is a fun spot in a nice peaceful setting. 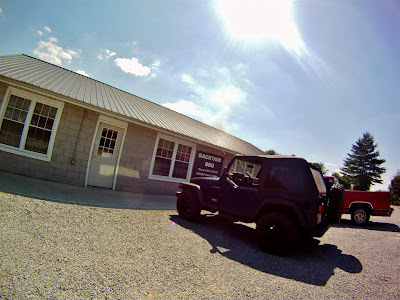 It looks like most people stop by to grab a carryout order, but they do have several picnic tables with umbrella cover and on a nice summer day it's a great place to relax and enjoy a good meal. Ron & Sue couldn't be any friendlier, so if you enjoy talking BBQ you might find the conversation and hospitality are as good as the food. I could sit out here all day. HH is all about hickory smoked pulled pork and baby back ribs, and they do a few different things that set them apart from other places. 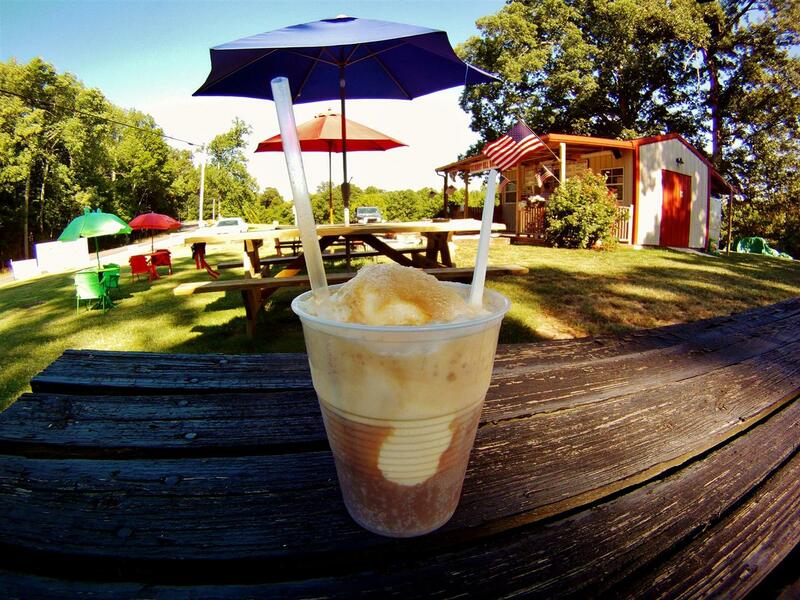 For example, root beer floats! 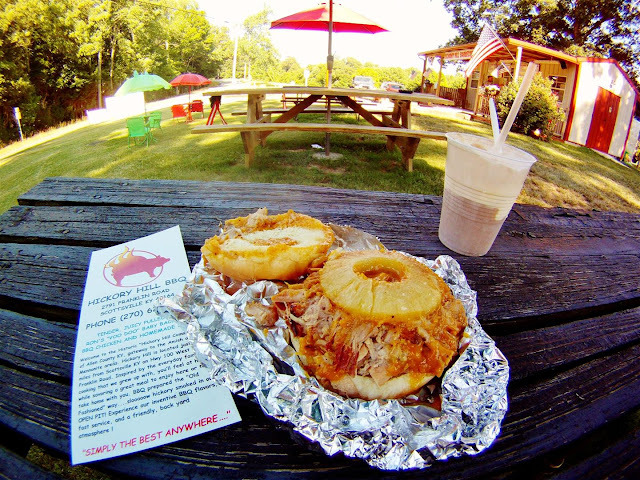 Also, the Island BBQ sandwich is something special -- pulled pork drizzled with their sweet tropical Island Sauce and topped with a pineapple slice. Brilliant. They do serve chicken in a few different ways, but I haven't tried any yet. The pulled pork and the baby back ribs are as good as it gets if you like this BBQ style. The pork has a nice bark and a perfect smoke flavor. I usually prefer wet ribs and I planned on adding some sauce to these baby backs, which are served dry. But after I tried one I forgot about the sauce. They are nicely trimmed, the rub has just enough spice, and the meat comes off the bone just right for my tastes. The homemade sides are excellent. I especially like the BBQ beans that contain chunks of pulled pork and are very similar to Split Tree's, but not as spicy. This is one of those places that forces you to make difficult decisions -- the smoked meats are so good that they don't need sauce, but the sauces are so good that you should sample them. Their Mild Sauce is a sweet & tangy tomato-based deal, and the Hot Sauce adds quite a kick to that formula. The Sweet Sauce is darker & thicker with a sweet smoky flavor. The Bourbon Sauce & Island Sauce are both unique, both smooth, and both compliment the smoked pork very well. 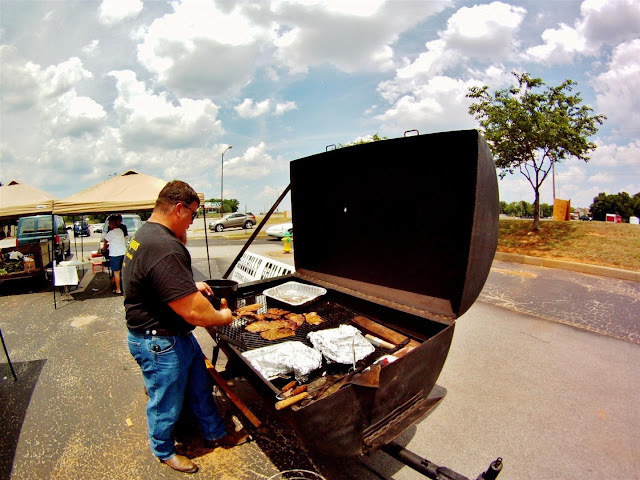 Although the hours are limited, you can buy their BBQ at other places such as Dolphie's Lounge in Bowling Green and Kenny Perry's Country Creek Golf Course in Franklin. 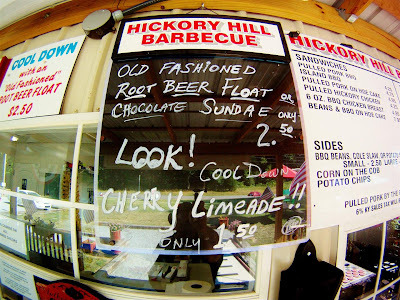 For the proper experience, do yourself a favor and visit Hickory Hill on a nice weekend afternoon when you have time to enjoy some great BBQ, a root beer float or a cold sweet tea, and a slow drive through Mennonite country. You'll be glad you did, and if you visit on Friday you can always come back the next day. Pulled Pork w/ BBQ Beans & Corn on the Cob. Half Slab Baby Back Ribs w/ Slaw & Potato Salad. I don't know how those ribs could be any better. 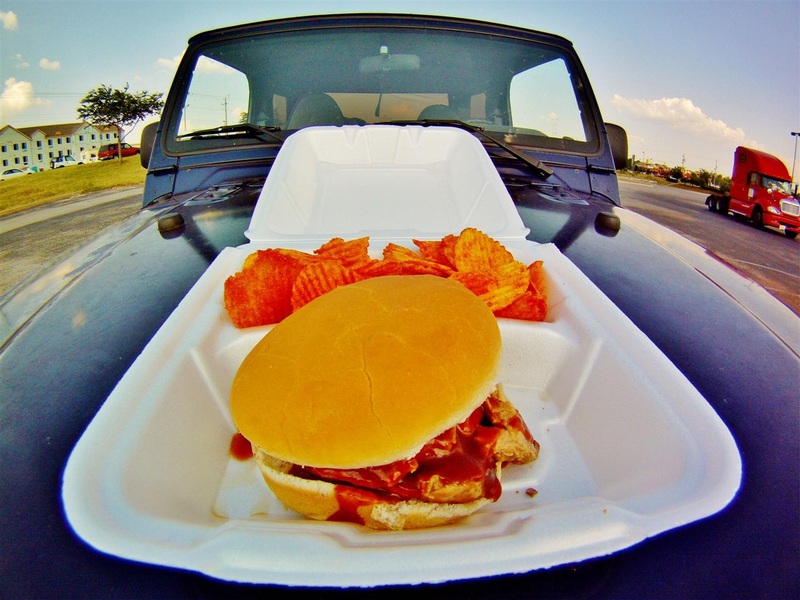 Island BBQ Sandwich (to go). Pulled Pork on Hoe Cake w/ Hot Sauce. The Sauces (Island Sauce not pictured). Full Slab Baby Back Ribs w/ Hot & Mild Sauce (to go). I'd like to reserve that parking spot because I'll be using it often on Fridays & Saturdays. 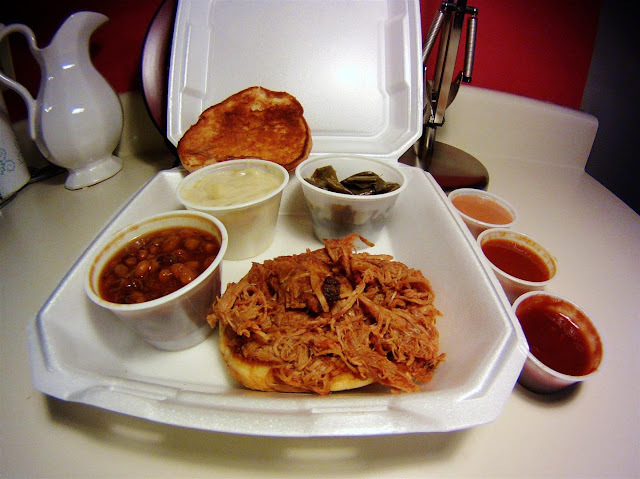 Smoke Shack BBQ in Scottsville is our other local example of Monroe County BBQ. It is almost exactly the same distance from my couch as Smokey Pig, and the dipped shoulder is every bit as good. They do have two tables and a few chairs here, so you might be able to sit down for lunch. But most people just run in to grab a to-go order real quick. In fact, not once have I been here when several customers weren't doing exactly that, no matter what odd time of day I've shown up. This place is popular. The Smoke Shack sauce is a bright orange vinegar & super peppery deal and you can order your meat sprinkled or dipped, depending on how spicy you want it. You want it dipped. And you want the shoulder. Like Smokey Pig, if you come here and you don't try the dipped shoulder than you haven't really tried Smoke Shack BBQ! The pork shoulder is sliced very thin before being grilled, and of course they also serve the obligatory shredded pork and ribs. The shredded pork is already mixed up with a sweet tomato-based BBQ sauce. The ribs do have a nice bark and smoke ring and are coated with a sauce similar to Cattlemen's after they are smoked (you can still order them sprinkled or dipped). The grilled chicken breast and pork chops are also great dipped or sprinkled. Half-chickens and sometimes pulled chicken is available. The vinegar slaw is surprisingly sweet and it helps you cool off after the dipped shoulder lights you up. If you do visit Smoke Shack BBQ, I highly suggest taking home a pint of their sauce. You can dip everything you eat for a week! Dipped Shoulder Sandwich (to go). Bread never tasted so good. Sprinkled Ribs (minus one that was already eaten) w/ Vinegar Slaw. Shredded Pork Sandwich w/ Potato Salad & Vinegar Slaw (to go). Dipped Pork Chops w/ Potato Salad & Vinegar Slaw (to go). Sprinkled Grilled Chicken Breast w/ Potato Salad & Beans (to go). Horace Dunn knows BBQ, and his is a neat place like no other in the area. 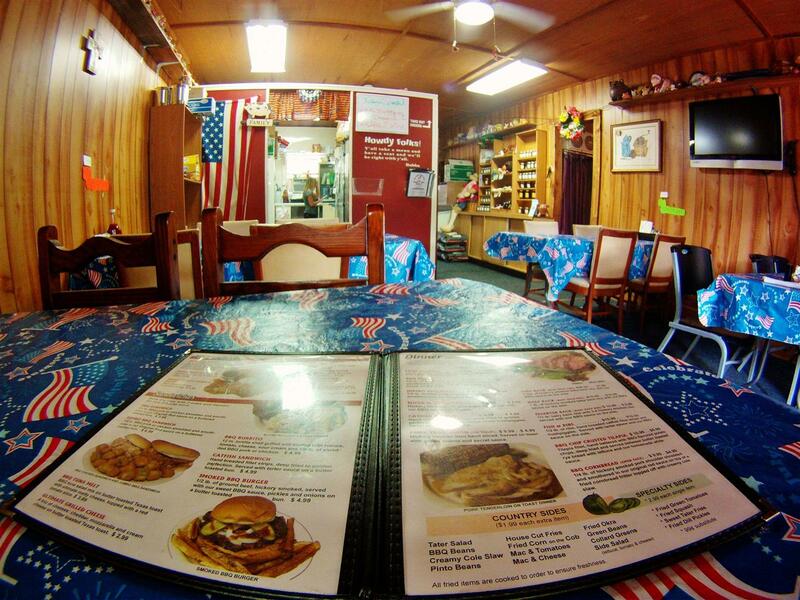 It is a one man operation with a small menu in a small building that produces hickory-smoked BBQ with big taste. Located at the corner of Jefferson St & John J Johnson Ave, it's just a few blocks from the Franklin town square. There are a few chairs inside, but don't plan on eating there -- every time I've visited, that table is already taken. 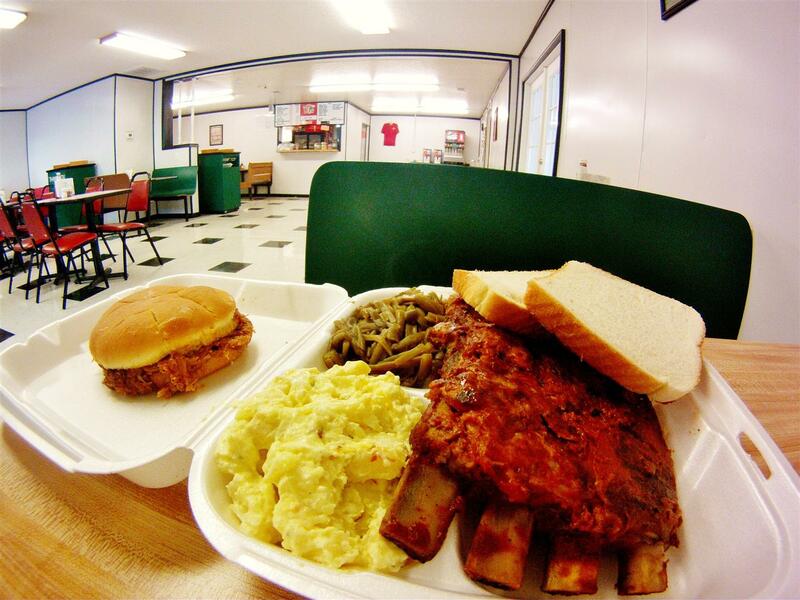 Dunn's offers pulled pork and ribs, and you can choose between three sides: potato salad, slaw, and baked beans. Everything is great. It reminds me a lot of Third's BBQ in BG -- the smoked pork has a solid hickory flavor, and the sides just seem sweeter here than at other places. The sauce is rich and sweet with a heavy tomato flavor and it goes great with the pork. Because it is a one man operation, it's only open a few days per week. So it is a good idea to call first (especially if you are driving to Franklin just for BBQ), but right now Dunn's is open Wed - Fri. If you want the ribs you'd best go Wednesday -- my last visit was on a Thursday afternoon and the ribs were long gone. One other piece of advice: if you do get the ribs and you are not eating them right away, tell Mr. Dunn that you don't need them warmed up. Take them home and warm them up in your oven (not microwave). They are great. BBQ on Bun Dinner w/ Slaw & Beans (to go). Rib Dinner w/ Slaw & Potato Salad (to go). BBQ on Cornbread (to go). I'm about to show some bias again because Wildfire is one of my favorites. This was the first place I rode to for BBQ when I moved back to South Central KY several years ago, and last year it was the destination for my first Countryside Food Ride. With Wildfire & Dunn's, I do believe Franklin is a great BBQ town. Like Split Tree, it has the proper look and feel for a BBQ joint. The interior has a cozy rustic feel, and the decor is fun with small pig figurines lining just about every available surface. Two things really set Wildfire apart from the other places on this page -- the big menu and the sauces. They smoke pork & beef brisket overnight and ribs & chicken throughout the day. All the smoked meats have a good hickory flavor. If you've never been, the Pit Combo is a good sample of what they do here because it comes with sliced pork shoulder, pulled pork, and beef brisket. The baby back ribs are just about perfect if you like slow smoked baby back ribs. As good as they are, the best thing here might be the dry rubbed half-chicken. Wow. Wildfire also distinguishes itself from other local BBQ joints with fun things like loaded BBQ potatoes, BBQ nachos, and loaded BBQ fries. The sides are good, fresh, and homemade. 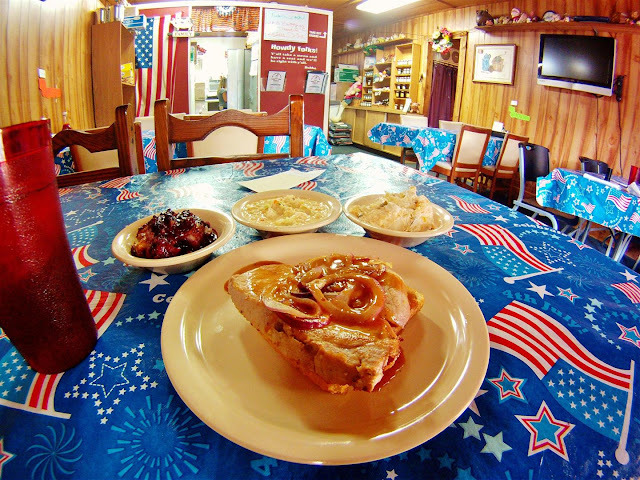 In addition to the standard choices of potato salad, slaw, and beans, they have items like french fries, onion rings, homemade potato chips, and fried corn-on-the-cob. The fries and onion rings are always fresh, and the corn and chips are great. There should be a BBQ sauce here for everybody. The Vinegar sauce is light and refreshing, not spicy. The House Mild is like most sauces around here -- a tangy sweet tomato-based sauce that nicely compliments the pork. The House Medium is similar, but it adds a good pepper kick and is probably spicy enough for most people. And then there's the Wildfire, which you have to request from the back. It is the hottest tomato-based BBQ sauce in the land. It has a great flavor, but if it's too spicy for you just make a Wildfire + Vinegar mixture and it's awesome. Awesome! Pit Combo (Sliced Pork Shoulder, Pulled Pork, & Beef Brisket) w/ Slaw & Hog Fries. Dry Rub Half Chicken w/ Fried Corn (to go). Grilled Chicken Sandwich w/ Fried Corn & Homemade Chips (to go). Baby Back Ribs w/ House Medium Sauce (to go). Pound Hound & Super Duke @ Porky Pig Diner. Porky Pig Diner is not a BBQ joint; it's a neat little country diner at the border of Mammoth Cave National Park in a place actually named Pig, KY. I include it on this page so I can show off my favorite picture ever, and also because their most popular item is the BBQ sandwich. The pulled pork is smoked on-site and their BBQ sauce is a slightly darker version of the sweet tangy mixture so popular in these parts. Porky Pig is definitely worth visiting even if you don't try the BBQ (which is quite good). It seems that everybody around here knows who Calvin & Ramona are, and you're likely to meet some other characters when you stop by. You'll get to try the buffet if you visit on Sunday. BBQ Sandwich w/ Potato Salad. Big Moose's has a great name and it's the only BBQ place in Glasgow that I ever hear anyone talk about. 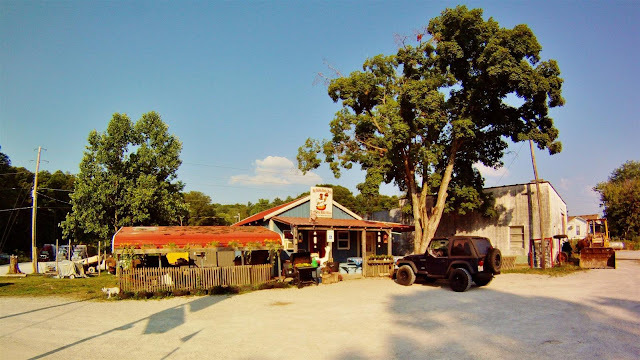 It's more than just a BBQ spot -- after a few visits I consider it a fun cafe-style family restaurant that happens to serve some really good BBQ. 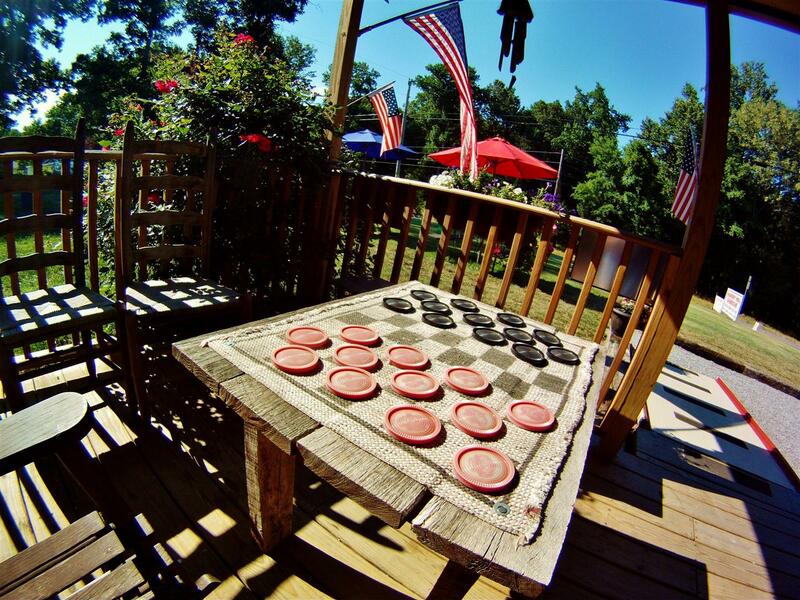 The decor provides a cool atmosphere to enjoy some BBQ or a burger. The line often extends out the door, but the line moves fast and you never wait for your food. The two tomato-based sauces are known as Thick Sauce, which has a heavy smoke flavor, and Brisket Sauce, which is sweet instead of smokey. There are four vinegar-based varieties that get progressively spicier: Mild, Hot, 5-Drop, and 10-Drop. Mild is found in a bottle on each table and it is the default sauce if you place a to-go order. I enjoyed it with the sliced pork shoulder before and after I knew about the other sauces. The 5-Drop and 10-Drop are serious business, and great with the sliced pork shoulder. The sides here really shine. The sweet potatoes are sweet enough to be dessert, and it sounds like the hashbrown casserole is the next most popular choice for good reason. Indian stew is like a thick vegetable soup made with chunks of meat instead of veggies. The steak fries are good, and they're great if you request a fresh batch and wait a couple extra minutes. Oh, and they have hush puppies! If you're looking for BBQ in Glasgow, this is the place to go. Sliced Pork Shoulder, Slaw, Sweet Potatoes, & Hush Puppies. Brisket Sandwich w/ Slaw & Hashbrown Casserole (to go). The Sauces: Mild, Hot, 5-Drop, 10-Drop, Thick, & Brisket. Shredded Pork Sandwich w/ Steak Fries. Baby Back Ribs w/ Potato Salad, Beans, & Hush Puppies (to go). Grilled Chicken Sandwich w/ Indian Stew & Sweet Potatoes (to go). Everybody knows about Roy's Bar-B-Q, and I'm not just talking about everybody in Russellville. I know people who drive to Logan County just for this BBQ. They have two locations in Russellville -- there is a newer sit-down restaurant with a full menu, and this older location where you can still stop to pick up some BBQ. I haven't visited the restaurant yet, but I've had a lot of pulled pork from this spot, which was the second Roy's location after they upgraded from the trailer/camper that the business started in. The BBQ is actually smoked at the restaurant now, so this is like a satellite drive-thru that's quick and convenient. There are a few tables inside but I believe most of their business is conducted through the drive-up/walk-up window. You can get chicken, beef, and ribs here, but all I've ever had is the pulled pork and beans. I don't know what it is, but there is just something different about Roy's. Perhaps they apply a finishing sauce after it is pulled -- it is slightly sweeter and saltier than the other pulled pork I've sampled in the area. Their BBQ sauce is another sweet & tangy tomato-based sauce, but like the pork there is just something different about it. I can't put my finger on it, but I like it. A slightly thinner hot sauce is also available and I usually mix the two because I can't decide which to use. If you haven't tried Roy's yet, you should. Pulled Pork Sandwich w/ Beans. Because I don't have enough Roy's pictures. Red Barn is hidden behind a grocery store on the way into or out of Tompkinsville, but it's not hard to spot. I've only visited once, so I don't know much about place. But I do think it's the only Tompkinsville BBQ joint I've been to that hasn't burned down! We're in Monroe County, so we're here for the sliced pork shoulder, of course. The slices seemed smaller than at other places, but perhaps I caught them at the wrong time. The sauce is as good & spicy as expected, and the sides are good. 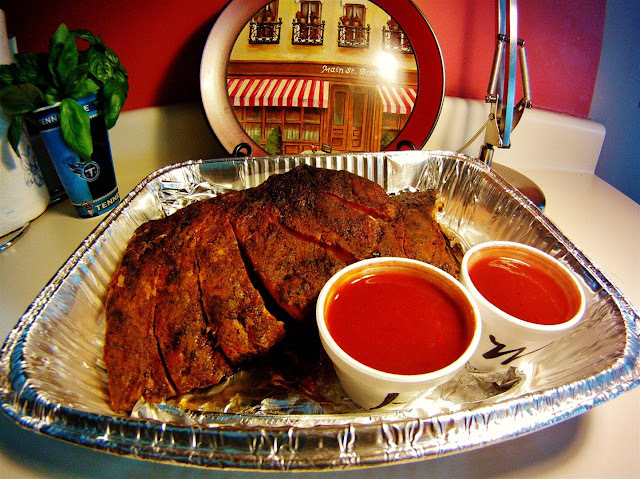 The shredded pork and ribs seem about the same as the other places, and the ribs are coated with a tomato-based BBQ sauce and served as a slab rather than sliced. Like all the other places in Tompkinsville, there is a steady stream of carryout customers and the food is still ready right away. Sliced Pork Shoulder w/ Vinegar Salw & BBQ Eggs. Shredded Pork Sandwich and Ribs w/ Potato Salad & Green Beans. Because I don't have enough Red Barn pictures. R&S Bar-B-Q is located just a couple blocks from downtown Tompkinsville, but there's nothing flashy about it and it's easy to miss. I might have drove past it the first time and I won't do that again. R&S did burn down in the past, but this location has been operating for over a decade. So you know they know BBQ. The pictures don't do this place justice -- it was a little bit dark inside, which is nice, but not so nice for the camera. When you step up to the order window, the first thing you'll notice is the huge grill lining the back wall of the kitchen. Very cool. After placing my order and reading the framed newspaper article on the wall, I realized that the lady with the big smile who took my order was Anita, the owner. I saw her preparing my order, and I saw her handling a shovel full of hot coals for the grill, and I saw her working the meats on the grill... so I'll go out on a limb and guess she also does most the cooking when nobody is watching. 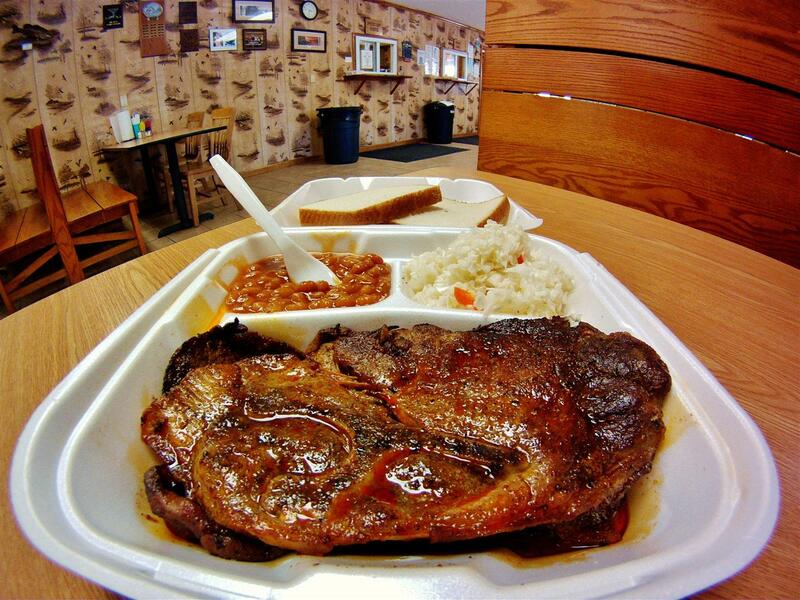 Unlike the other Monroe County BBQ places, Anita did not say her sliced pork shoulder was the best thing on the menu. She seemed equally confident in the ribs, the pork chops, and the shredded pork. She assured me that her shredded pork was the real deal, but it was gone by the time I arrived so I didn't get to try it. Next time! The pork shoulder has a great grilled flavor and the spicy vinegar sauce is a little different than the other places I've sampled -- it's dark brown and the spicy pepper kick has a more earthy taste, for lack of a better word. Perhaps they use different peppers and spices, and less cayenne than the other places? Whatever it is, it works. The big spare ribs are served sliced and they, too, have a great grill flavor. I took some extra sauce home for them and they were superb. The sides each seem to have a little something special that sets them apart from other places, as well. The green beans are especially good, even for someone who doesn't especially like green beans. If you're grabbing a carryout order, you'll appreciate the careful way everything is packaged so the sides don't slosh around and spill before you get home. Perhaps the best thing I've seen hanging on the wall of a BBQ joint. Re-opening ribbon cutting ceremony after R&S burnt down over a decade ago. Pork Shoulder w/ Green Beans & Vinegar Slaw (packaged to go). Ribs w/ Vinegar Slaw & Potato Salad (packaged to go). Ribs w/ Green Beans & Vinegar Slaw (back home). Frances is located just a couple blocks from downtown Tompkinsville, and this is another place that's easy to miss if you've never been there before. 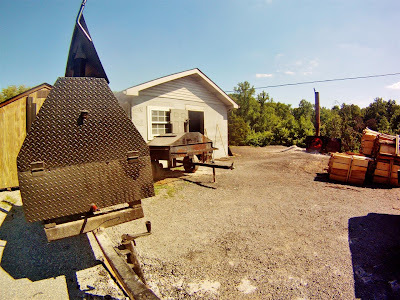 The original Frances BBQ was located a few miles outside of town, but... you guessed it -- it burnt down. This location has a couple dining rooms and a big deck with tables & chairs for outside eating. It also has a huge menu and the owner, David, confirmed that their most popular product is the sliced pork shoulder. David must have noticed that I wasn't a regular customer and he told me a bit about the Frances BBQ history -- he and his wife now run this restaurant that his mother ran before the fire. A framed picture display on the wall shows some of the story, and I'm sure David would be glad to tell you a lot more. The pork shoulder is perfectly grilled and the sauce is as spicy as you'd expect. 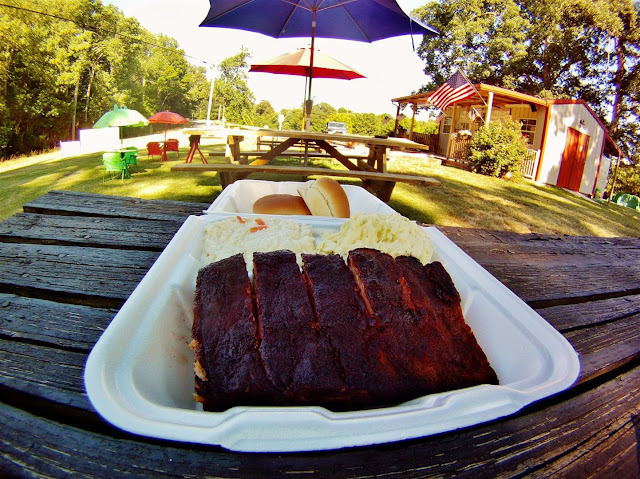 The big spare ribs have a nice smoke ring and great flavor after being coated in the Sweet Sauce that David and his buddy, country music singer John Anderson, came up with. They are served as a big slab, and I mean big! They also have the obligatory shredded pork, of course, and I noticed brisket on the menu that I will return for. All the sides that we tried were good and they seemed particularly sweet -- a nice welcome compliment to the spicy pork shoulder. The BBQ is great, the people are friendly, and I'll be back. This framed display shows the history of Frances BBQ. On the left is the original Frances location and her old cooking knife. In the middle are some pictures of the 2009 fire. On the right we see the new location. Their slogan kinda gets your attention. Pork Shoulder w/ Green Beans & Vinegar Slaw. Ribs w/ Potato Salad & Baked Beans (to go). Ribs w/ Potato Salad & Baked Beans (back home). Backyard was the first BBQ place I visited in Monroe County. I wasn't exactly sure where it was, but it's hard to miss the grills and the big furnace action next to the building on the side of the road. I was surprised at how new the building was. Yup, that's because the last one burnt down in 2009. The sliced shoulder with hot sauce is awesome. Of the four Tompkinsville places I sampled, this seemed closest to what I was used to from Smokey Pig in Bowling Green and Smoke Shack in Scottsville. They serve country-style ribs coated in a tomato-based sauce, and they also have shredded pork, of course. 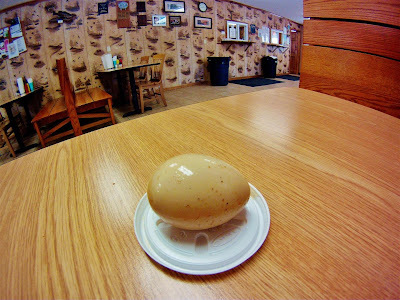 Perhaps my favorite side item was something I've never seen -- BBQ Eggs. 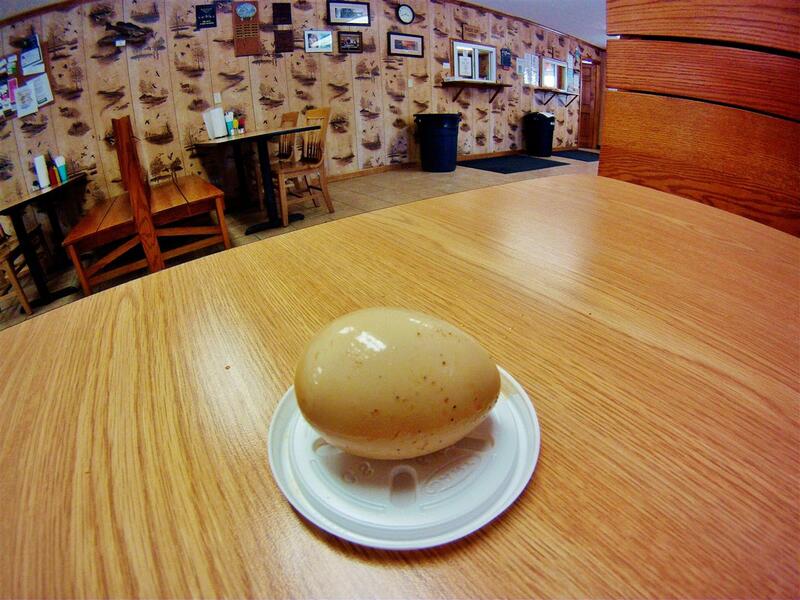 Brilliantly simple, it's just a hardboiled egg dipped in the BBQ sauce! I guess this is another Monroe County thing because I did notice it at some of the other places. Love it. For some reason, this seems like a great place to stop when you're out on a nice ride with some motorcycle buds. Perhaps it's because of the location -- out in the country instead of in downtown Tompkinsville. Perhaps it's because there is plenty of seating and the big booths have room for you and your gear, if you wear gear. And perhaps it's just because that pork shoulder is so awesome. This should get your attention when driving by. New building with a big dining area. Pork Shoulder w/ Baked Beans & Vinegar Slaw. Country Ribs w/ Vinegar Slaw & French Fries. Shredded Pork Sandwich w/ Potato Salad & Slaw. Big Bubba Bucks Belly Bustin' BBQ Bliss. This a small place that churns out a lot of hickory smoked BBQ. 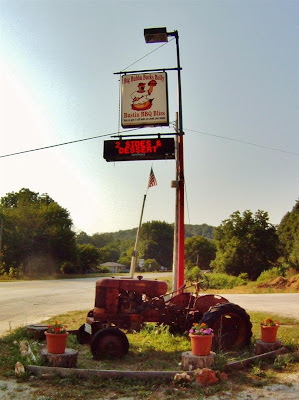 Located at Exit 65 on I-65, the truck drivers heading north and south are obviously the target market -- there is plenty of space for truck parking out back, and they use the CB to advertise the daily specials every five minutes or so and even take orders. If you eat inside, you'll hear the CB messages going out like clockwork, and you'll see the truckers pulling in to pick up their grub. You can tell by the name that this place is a little different. When it comes to BBQ, they do some things that I haven't seen elsewhere. They definitely fit into the Western Kentucky BBQ category because everything is cooked slow in hickory smoke. Unlike the thinly sliced grilled pork shoulder that is served by Monroe County BBQ joints, here they smoke a thicker pork shoulder steak. But like the Monroe County BBQ joints, they serve shredded pork that is already mixed with their sauce instead of pulled pork served without sauce. However, this is the only shredded pork I've sampled that still has a good bark and a strong smoke flavor, so if you like the sauce it's all good. Unfortunately, I visited late in the day and their two most popular items were already sold out -- the smoked pork shoulder steak and the ribs. I will get some the next time I'm in the neighborhood, but on this visit I tried the pork tenderloin plate. It was excellent. Thick slices of smoked tenderloin are served on toast with grilled red onions and their S.O.B. Sauce. The pork is plenty moist with a strong smoke flavor, and I've never seen it served this way elsewhere. Speaking of sauces, the Bubba's BBQ Sauce is a thin, bright red, tomato-based sauce that is sweet and tangy. The Hot Sauce is spiced up with chunks of diced green chili pepper (I think), and the texture makes it unlike anything else around here. The S.O.B. Sauce is a creamy mayo-based sauce that goes great on that pork tenderloin and would probably be good with french fries, too. The sides are all homemade and also somewhat unique -- we loved the BBQ beans and the green beans. Although I never order dessert, the meals here are served with two sides and a dessert -- the blackberry cobbler was really good, and I don't eat banana-flavored stuff, but the banana pudding was well received back home. I sense that the pudding is well known around here, as every CB callout ends with a reminder to get the Nanner Nanner Nanner Puddin'! I've seen some online reviews that make this place sound like a real dive and maybe a place you don't want to bring the family for a sit-down meal. I disagree. I thought it was charming and fun, and I'd be glad to stop for a meal with the family next time we're heading North or heading back. You can see from the pictures that it is a small tidy place, and the BBQ is great. I'll definitely be back earlier in the day to try those ribs and the smoked shoulder steak. They have several smokers, and all of 'em are dressed up like pigs. ... And it's a surprisingly big menu for such a small place. Appropriately Assigned Alliteration Award. Awesome! Absolutely Amazing! Pork Tenderloin w/ Tater Salad, Creamy Coleslaw, & Blackberry Cobbler. Shredded Pork Sandwich w/ Green Beans, BBQ Beans, & Nanner Puddin' (to go). S.O.B Sauce, Hot Sauce, & Bubba's BBQ Sauce, from top-to-bottom. Easy to remember: I-65, Exit 65, 1/2 mile North. There is no handicapped placard on that cop car. Just sayin'. Elizabethtown might not be in South Central Kentucky, but Texas Outlaw is the home of America's Best Ribs and it would be a crime to not mention them on this page. I first learned about this place when I saw them win a national rib competition on Food Network (I think) probably six or seven years ago. 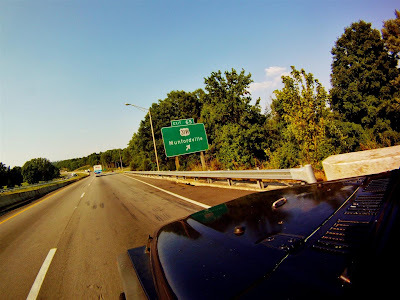 I was excited to learn that their restaurant was nearby, and I was initially surprised to find it nestled among E-Town's complex of hotels and chain restaurants located at I-65 Exit 94. This doesn't seem like a real BBQ scene; it seems like a Shoney's scene. But if you drive past Ruby Tuesdays & Cracker Barrel, and turn right into Texas Outlaw instead of turning left into Texas Roadhouse, you'll find that the ribs do not disappoint! A dry rub is applied to the baby backs before they are smoked. They are mopped with the Bold & Spicy sauce while smoking and then finished with the Honey BBQ sauce. They are smokey, succulent, sweet, and spicy all at the same time. The pulled pork and shredded beef brisket are equally impressive and as good as anything else on this page. The dark sweet Honey BBQ sauce is the only sauce they serve and it's great, but get it on the side if you aren't having ribs so you can sample the authentic hickory taste of these meats first. This is a full-service restaurant with a big menu, a full bar, and late hours (compared to most BBQ joints). I've never actually seen the restaurant space -- I've only been in the bar area while I wait for my to-go orders and I've never waited long. It seems like a fun atmosphere, especially when they have live music on weekend nights. I have seen some really bad reviews online and that puzzles me, but I'm guessing those people aren't BBQ fanatics. I know nothing about the steaks, chicken, seafood, or a real dining experience here. I do know that if you are looking for top-notch BBQ you will not be disappointed with their product. And I most definitely recommend making a pit stop here after a long day spent at the Indianapolis Motor Speedway or Beatersville. BBQ competition trophies greet you when you open the door. More trophies and first-place posters are on display in the lobby. The Texas Outlaw Story (taken from the menu). There's a lot to like in those words. Beef Brisket & Pulled Pork w/ Slaw & Potato Salad (sauce on side). It's a bad picture of great BBQ, and you can see smoke ring evidence on both meats. Half Rack of America's Greatest Ribs & Loaded Baked Potato (to go). You can take both BBQ Sauces and the Rub (not pictured) home. Go ahead... be the neighborhood hero outlaw. Boca BBQ with James Hinchcliffe in Turn 1 @ 2012 Indy 500. Thanks for this! My husband and I love BBQ and moved to BG last year. We are always looking for new places to try. We love having an idea what to expect when we go in, and this really helps! Next time you are in Hart Co., you should try Mama Lou's! Hi Lisa, did you get to try any of these spots over the summer? 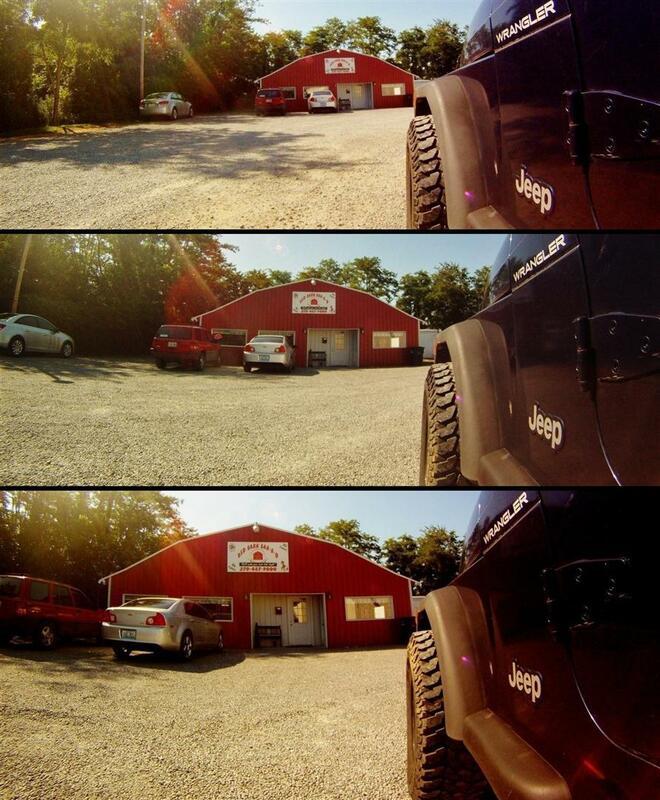 We did visit both Mary Lou locations this year, and I should probably put some pictures up. Good stuff, indeed! Copyright Rob Baas 2011-2012. Awesome Inc. theme. Powered by Blogger.